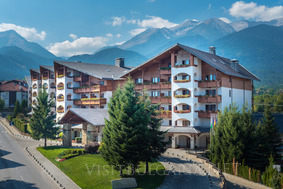 Accommodation: The hotel offers Alpine-style spacious rooms and suites with spectacular views of the Pirin Mountain. There are 157 rooms and suites, including 110 Deluxe Rooms, 22 Executive Rooms, 14 Junior Suites, 7 Deluxe Suites, 3 Alpine Suites and 1 Presidential Suite. Every room features a private balcony, a spacious bathroom with a separate bathtub and shower cabin, air conditioning, cable TV, a mini bar, free high speed Wi Fi, a study desk, a safe box. The brand new luxurious Presidential suite offers elegant atmosphere, comfort and ultimate privacy with the impressive size of 240 sqm. This VIP suite features two bedrooms and a spacious living room with a remote-operated fireplace, a dining area, a bar corner, a 50” flat screen TV and a conference area capable of hosting up to 10 people. The master bathroom is a true masterpiece - Italian stone, marble sinks with eco-friendly filters, a Jacuzzi and a 32" flat screen TV are just some of the amenities. The suite has private access with the hotel elevator, accessible only with the suite’s key card. Bars and restaurants: The Gallery restaurant offers lavish breakfasts, exclusive theme buffets and restaurant Come Prima offers Mediterranean delicacies. The Lobby Bar offers freshly brewed coffee and tea and delicious cakes. Enjoy a summer cocktail at the La Veranda Bar & Lounge: terrace under the sky with a breathtaking view to Pirin Mountain. Conference facilities: For corporate events and festive occasions there are four meeting rooms with natural daylight for 12 to 180 persons. A dedicated Meetings Concierge will be appointed to plan and organize your seminars and conferences while maintaining the high international standard of Kempinski. SPA centre: Kempinski The Spa offers various massages, treatments and procedures, outdoor and indoor swimming pools, indoor and outdoor hot tubs, outdoor tennis court, 2 types of steam baths - Hammam Steam Bath and Aroma Steam Bath, 2 types of saunas-Finnish and Bio Sauna, fitness centre, solarium and a unique snow room. Table tennis, darts, billiards and a kids’ club are available. The hotel has a new-generation spa with unique-for-Bulgaria thermal facilities of the world-leading Germany company Klafs. The fully refurbished spa centre offers indoor and outdoor swimming pools, outdoor children's pool, indoor and outdoor Jacuzzis, an authentic Finnish dry sauna, a last-generation herbal sauna with a capacity of 20 people, an infrared sauna with built-in biometric sensor (body temperature, blood pressure and heartbeat), and two experience showers for heat-cold contrast with four exotic experiences - warm tropical rain, cold waterfall, refreshing mist and power jets. For the first time in Bulgaria, guests can enjoy an innovative sanarium with a capacity of 15 people, a combination of steam bath and sauna and a tailor-made aroma steam bath with a capacity of 15 people, which is not only the first of its kind in Bulgaria but the first to be produced by the German manufacturer, the market leader for high-tech spa facilities. The spa centre also has a self-heating wellness bench, produced by individual design, a refreshing snow room and a specially organized deep digital detox area, equipped with five self-heating ergonomic wellness beds adjustable according to the individual preferences of the client. Here guests can immerse themselves in a fairy tale of fire and ice in front of a fireplace, opposite which is located an ice fountain for contrast therapy and designer Himalayan fountain with drinking water to quench the thirst. The Vitamin bar, next to the spa reception, has a completely new look with a modern relaxation area, a fireplace and an exotic inside landscaped courtyard garden, offering a wide choice of refreshing cocktails, and a healthy balanced menu.